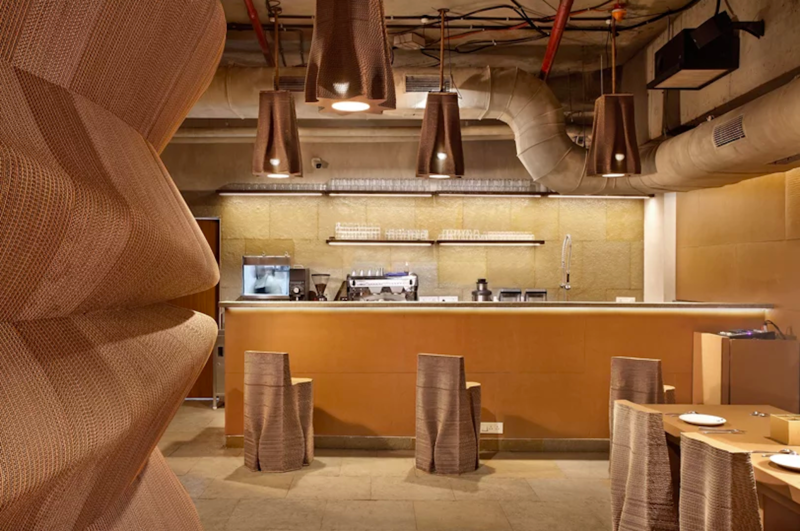 Situated in Mumbai’s bustling business district, a café interior made almost entirely from cardboard forces passersby to do a double take. 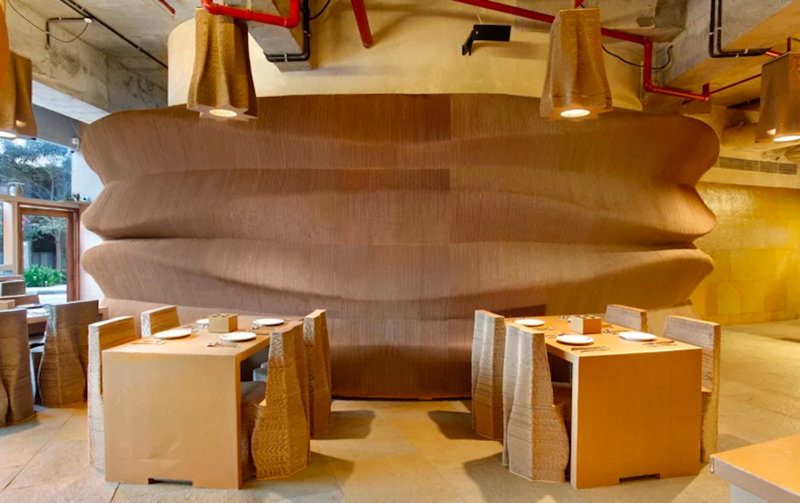 The unique establishment, known as “Cardboard Bombay,” is striking not only for its unconventional appearance but also for its sustainable design. 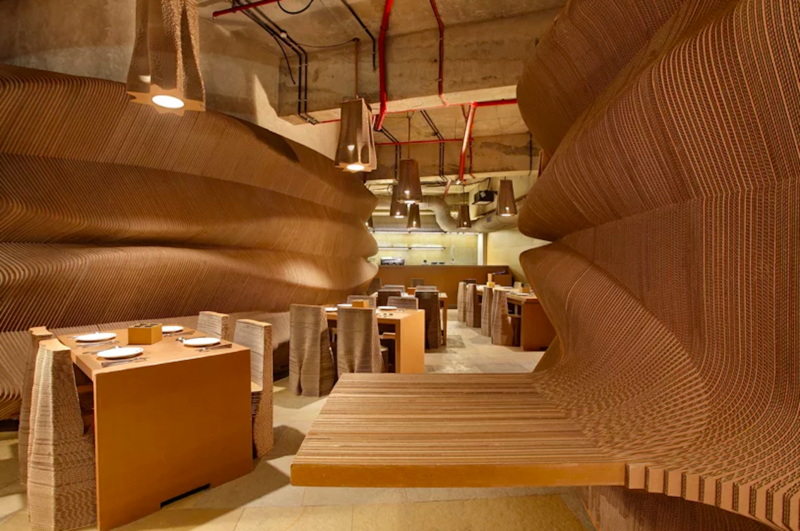 Against the backdrop of ubiquitous glass high-rises and fine-dining restaurants, the playful café serves coffee and casual bites in style while taking advantage of cardboard’s many sculptural and textural qualities. Designed by Nuru Karim, founder of Mumbai-based architectural firm NUDES, the space aims to promote conversation about the role of sustainable design in today’s urban landscape, as well as its impact on the future of Earth’s resources. Cardboard is an eco-friendly alternative to other materials, in that it is 100 percent recyclable and biodegradable. While durable, it is comprised of 50 percent air, making it extremely lightweight and versatile. Cardboard also has excellent sound absorption properties, making it a great acoustic solution for the food industry. Before being able to build with cardboard, NUDES researched the material in depth, which included testing cardboard with humidity, water resistance, and temperature fluctuations. 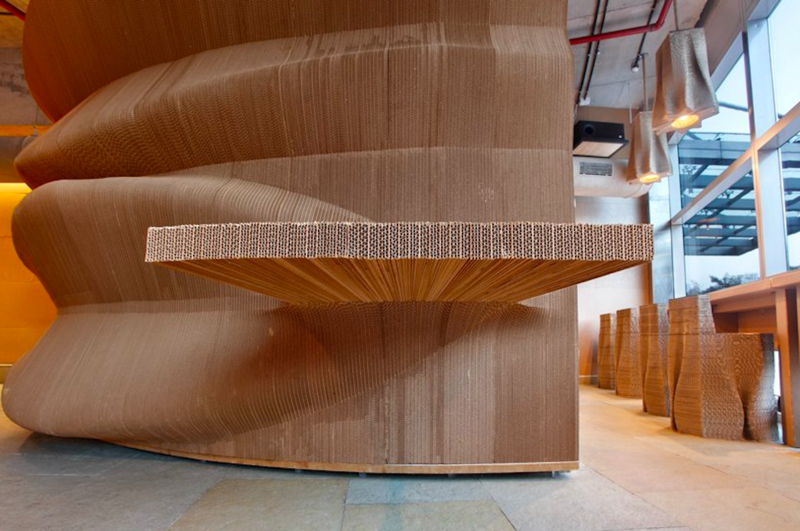 After conducting thorough research, NUDES took to sculpting the café’s bespoke furniture, light fixtures, accessories, and architectural elements entirely from cardboard. Designers stacked layers of cardboard to create the base of the chairs, and they laminated the cardboard tabletops—some of which cantilever from undulating cardboard wall partitions—with a wax treatment to prevent food and water damage. 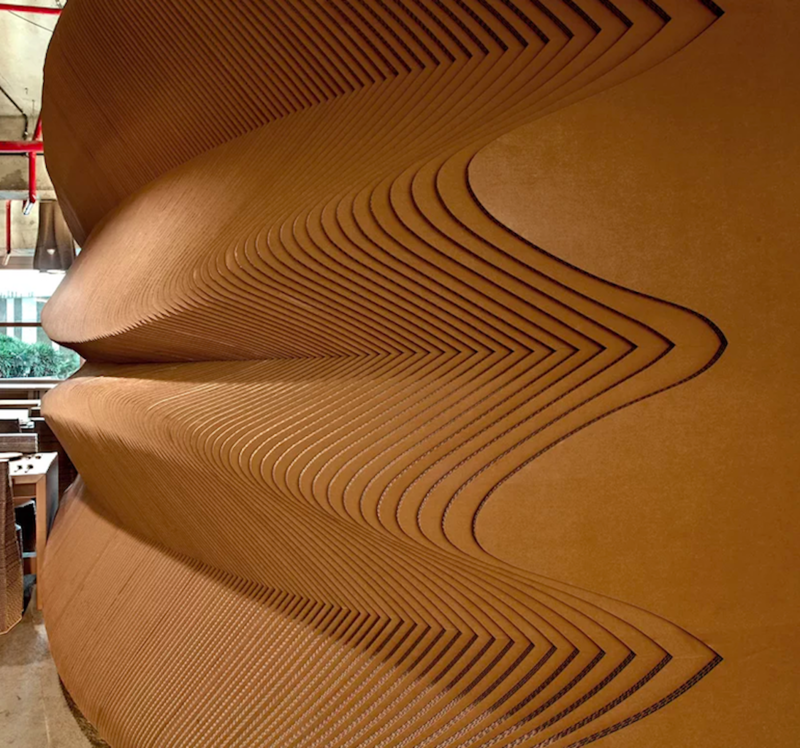 Even the walls are crafted from sinuous waves of cardboard fluting that, when layered next to each other, form intricate patterns, textures, and free-flowing geometries. The project took about seven months to complete, including four months of model-making and three months of construction. While Cardboard Bombay is India’s first café suited up with cardboard, let’s hope that it won’t be the last.